or even a heart themed frame in honor of Valentine’s Day. With your foam brush, paint the back side of the picture frame along with the outer edges as well as the inner edge of the picture window. Be sure to select a color that’ll compliment your scrapbook paper. It’s best if you keep your frame elevated on objects such as cans while you’re painting in order for it to dry properly. Take your scrapbook paper and cut it down to the exact size of the frame. You don’t have to be precise here, but leave a little extra paper on each of the sides to be safe (these will be trimmed in the later stages). Once you’ve cut the appropriate size, set your scrapbook paper aside for the time being. Apply your crafts glue to the front of your frame. Place your scrapbook paper faced down (blank side facing up). You’ll want to take your frame and press the front area (glued side) up against the paper so you’re gluing the two together. Press down firmly. Turn the frame over to where you’re now seeing the front of the frame. Take the edge of a credit card and smooth out any bubbles that may be trapped between the frame and paper and allow the frame to dry for a couple minutes. Place the frame on your cutting board and use your small knife to trim the extra scrapbook paper that might be hanging off the frame. 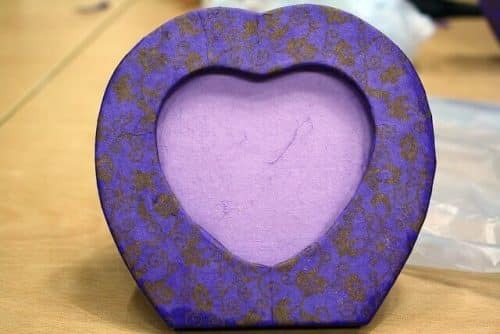 Nothing captures the spirit of Valentine’s Day more than a unique gift made out of love. With these tips, give your partner a sweet and heartfelt gift this Valentine’s Day without breaking the bank!